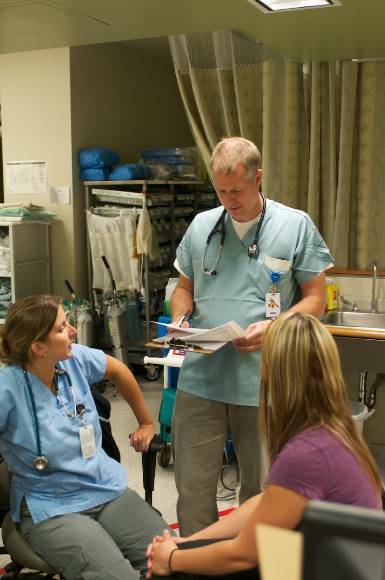 Recently PtboCanada went behind the scenes at PRHC’s Emergency Department. Most of us have been there at one time or another as patients or to assist sick family members. But what’s it like for the doctors who work there? More importantly, while we wait, what are they doing back there? 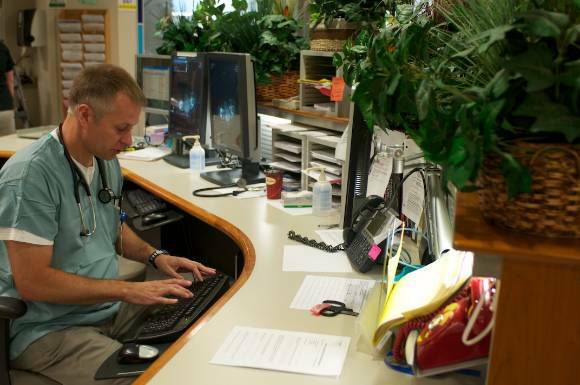 Turns out, seeing about 200 patients a day and dealing with a myriad of sick people. 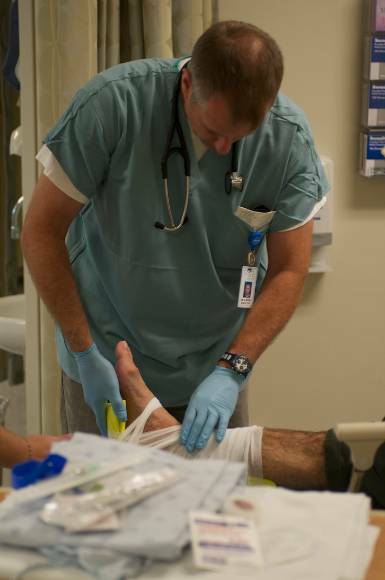 Thanks to Dr. Tony Jeffery, the ED staff, and his patients for letting PtboCanada photograph him on a shift and for keeping notes on his day for us. 11:00 h - Arrive and sign in on my personal tracker on the computer. There is only one chart in the rack – a slow start to the day, but I know it will pick up. First patient is an elderly man with chest pain and shortness of breath. I take a complete history and am concerned he may have a blood clot in his lung. Blood is sent to the lab and a chest X-ray ordered. 11:15 h – The rack is filling up with charts. I see two middle aged female patients, both with abdominal pain. I listen carefully to their stories and order appropriate tests. They will take some time working up. 11:45 h - The paramedics bring in a trauma - a man who has been in an accident and sustained a nasty fracture to his right leg, which will require surgery. I splint his leg for comfort while he waits for the orthopedic surgeon. 12:00 h - A late middle-aged man with chest pain arrives drenched in sweat. 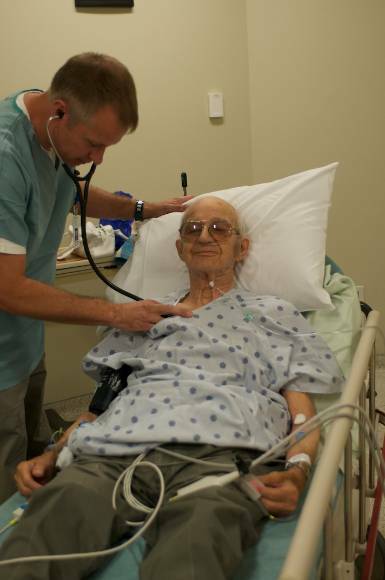 He has the look of someone having a heart attack, but his EKG doesn't support that diagnosis. We treat his pain and give him oxygen, but I am worried about him and contact the cardiologist on-call. 12:25 h – An elderly man arrives with rapid atrial fibrillation (an irregular heart rhythm) that had been occurring since the night before. He seems a good candidate for cardioversion (using electricity to reset the heart rhythm). I explain the procedure to him and after answering all his questions, he agrees. We sedate him with rapid-acting drugs and give him one shock at 200 Joules, which puts his heart back into a regular sinus rhythm. It is one of the most satisfying things we do in the ED. After he wakes up, he has no memory of being shocked, but he feels a lot better. 13:00 h - I take a break for lunch and then reassess my patients. I am able to discharge one of the women with belly pain and the man who we cardioverted. I order some follow-up investigations for him, including a Holter monitor. 14:00 h – An elderly woman presents with an episode of visual disturbance. She has had a stroke in the past and she is concerned it's happening again. To me, it sounds more like a migraine as she tells me her story. I take some time reassuring her, but to be safe I order a CT scan of her brain. 14:30 h - I see a very pleasant older woman who has had abdominal pain for several years and has been worked up assiduously by one of the local gastroenterologists. Her pain is worse today, but she looks remarkably well. I can see she is worried and in pain however, and knowing how stressful coming to the ED is for patients I order some pain medication and appropriate blood tests. 14:45 h - A younger man presents with chest pain after feeling like he might pass out. He has had panic attacks in the past and has a young baby at home. I suspect his symptoms are simply due to stress and we discuss this at length. After I am able to reassure him he isn’t having a heart attack, his pain goes away. Sometimes just listening to a patient and treating them with respect can be therapeutic. 17:00 h - I go to help out in Fast track (Ambulatory care) where they have fallen behind due to a surge in patients. I see as many patients as possible before my shift ends at 1900h - lacerations needing suturing, back strains, sore knees, children with coughs, rashes, and people who only need a prescription renewed because they have no family doctor.